Rome The Roman Republic - HISTORY'S HISTORIESYou are history. We are the future. By 600 BCE, the Etruscans were the most powerful people on the Italian peninsula. Etruscan monarchs ruled from north to south, including Rome. While the Latins before them also ruled through monarchy, the last three Roman kings were Etruscans. After ruling Rome for about 100 years, however, several factors contributed to the decline of Etruscan power and the end of Rome’s rule by kings. In place of the failed monarchies, the Romans instituted a Republican, or “representative,” form of government. With this new form of government in place, the Romans expanded their power throughout the Italian peninsula and across the Mediterranean. The Roman Republic lasted for about 500 years. According to Roman myth, Romulus founded Rome in 753 BCE and became its first king. The next three kings that followed Romulus to the throne were all Roman. Unlike monarchies elsewhere, the Roman crown was not passed down within a family. Instead, when a Roman king died, the Senate - a group of wealthy landowners - chose their next king. They could even choose someone from outside of Rome. After the rule of the third Roman king, that’s what happened. With more and more powerful Etruscans merging with the Roman population and taking up residence in the city, it wasn’t long before an Etruscan king was appointed to rule Rome. Due to several factors, however, Etruscan rule, was rather short lived. The Roman natives soon grew tired of their mistreatment at the hands of the Etruscan’s overbearing rule. While it’s true that the Etruscans used their engineers and artists to beautify Rome, Roman natives were taxed to pay for those projects. Additionally, they were being asked to abandon their farms to serve in the Etruscan/Roman army. It wasn’t long before resentment built up in the Roman population. In 509 BCE, a combination of resentment at home and Greek opposition to Roman expansion in the south eventually led to the overthrow of the Etruscan kings of Rome. After Rome overthrew the Etruscans, they instituted a form of government known as a republic. “Republic” comes from the Latin words “res” and “publica” and literally means “thing of the people.” A republic is a type of government in which the citizens vote for their leaders. (The United States is a republic.) From its Latin roots, a republic belongs to its people, not to a king or queen. The Roman Republic operated very differently than the republic that is in place in the United States. The citizens of Rome were divided into two groups. The patricians were wealthy landowners. Patricians could hold government offices. The second group was made up of shopkeepers, artisans, and small farmers. They were the plebeians. In other words, all of the Roman citizens who were not patricians were plebeians. The great majority of Romans were plebeians. Of course, there were other people living in ancient Rome who were neither patricians nor plebeians. Those people included slaves and foreigners. Neither slaves nor foreigners were considered to be Roman citizens. All patrician and plebeian men were citizens and had the right to vote. All citizens had to pay taxes and join the army, but only patricians could be in government. The government of the Roman Republic was very complicated. It had a constitution and detailed laws, and it had lots of leaders and councils. The Republic put in place a tripartite government. That means that it had three parts. Having three parts set up a system of checks and balances that was designed to stop any one part of the government from getting too much power. At the top of the Roman government were two leaders called consuls. Consuls were patricians who were partly in charge of the government. Each consul served for just one year. One consul headed the army. The other headed the rest of the government. So that one consul did not take too much power and become too much like a king or a dictator, each consul could veto, or reject, the other consul’s decision. “Veto” means “ I forbid” in Latin. The republic had two legislative bodies that worked to make laws. The first of these legislative bodies was the Senate. 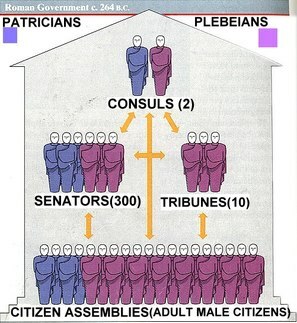 The Senate was made up of 300 patrician men. The senate members were not elected. Instead, they were appointed by the consuls. Once a member of the senate was appointed by the consul, he had the position for life. Senators passed laws and approved building projects. The second legislative body was the Assembly. Plebeians made up the Assembly. The Assembly could vote on laws, but the Senate could block their votes. Even though the Assembly had limited power, every year they were allowed to vote on which two Roman senators would serve as consuls. So if you happened to be an ambitious senator who wanted to one day become consul, you had to work with the Assembly and the plebeians. As Rome grew and gained more land, wealth, and influence in the region, the plebeians got mad. They began to worry that their interests and well-being were not being represented in the government. The Assembly could vote on laws but they could not propose them. From the plebeian perspective, they had all of the duties of citizens - paying taxes, serving in the army… but they could not truly be a part of the government. They wanted equal rights and they began to demand that the government become more representative of them. In an effort to secure greater representation, the plebeians threatened to go on strike in 494 BCE. Over the next 200 years, the threat of a plebeian strike became a common bargaining tool for the ordinary class of Roman citizens. If they went on strike, the plebeians told the government, they would quit working, perhaps even refuse to serve in the army. More, they threatened to leave the city to set up their own republic. Their actions scared the Senate who feared that the Roman Republic might collapse. In response to plebeian demands over time, the Roman Senate abolished slavery as a punishment for unpaid debts, changed marriage laws to allow patricians and plebeians to wed, and created a written record of the laws. The Senate also set up tribunes. The tribune’s job was to advise the Senate on the interests of the plebeians and to protect their rights. A tribune could stop the Roman Senate from making a law by simply shouting, “Veto.” Even with the participation of the tribunes, however, most of the real power in Rome remained in the hands of a few wealthy families. Cincinnatus left his plow for the sake of public service. Patricians and Plebeians and Dictators, Oh My! The Roman Republic also included dictators. Today, a dictator is a cruel ruler who controls everything. In early Rome, however, dictators were chosen by the Senate to rule during emergencies or times of war. In 458 BCE, the Roman army was attacked. In response, the Senate chose a farmer named Cincinnatus to serve as dictator. Two year’s previously, Cincinnatus had served the Republic as a well respected Consul. Upon being told of his selection as dictator, Cincinnatus went to work assembling an army and easily defeated the enemy. Afterward, he simply went home, back to his farm. Cincinnatus was famous for doing his civic duty by serving his government when he was needed. The Romans were one of the most legally minded people in history. It might be said that the development of their law has been Rome’s greatest and most enduring achievement. Roman law formed during the Republic. As the plebeians pressed their demands for more representation in government they saw that wealthy Romans still enjoyed more privilege. As a result, plebeians demanded that Rome’s laws be written down. That way, everyone could know the laws and make sure that judges followed them. In 451 BCE, Rome adopted its first written laws, known as the Twelve Tables. The laws were carved on bronze tablets and placed in the marketplace where everyone could see them. The Twelve Tables were based on the idea that everyone should be treated equally under the law. When Rome began taking over other countries, they made a new set of laws called the Law of Nations. The Law of Nations listed principles, or ideas, for justice. We still use some of these ideas today. For example, American law says that people are innocent until they are proven guilty. Rome’s legal system treated everyone equally. This is called the “rule of law." Many wealthy Romans, however, did not like the "rule of law." Patricians were used to having special privileges. In fact, many wealthy people were not used to obeying law at all. The "rule of law" changed that. Carthage was a powerful city-state located in North Africa. Carthage developed a huge trading empire and, as a result of their trading power, it became the largest and richest city in the western Mediterranean. Rome’s push to expand southward created conflict between Rome and Carthage. In 264 BCE the first of the Punic Wars broke out over control of trade in the region. This first war lasted 20 years and resulted in A Roman victory. After the Roman victory, Carthage had to leave Sicily and pay a huge fine to the Romans. Carthage then conquered Spain. Rome helped the Spanish people rebel. In retaliation, in 218 BCE Carthage sent their great general, Hannibal, to attack Rome. This started the second Punic War. Hannibal and his men sailed to Spain and rode horses and elephants across the alps to invade Italy from the north. While Carthage enjoyed early military success, Rome sent a general of their own, Scipio, to capture Spain and attack Carthage. Hannibal and his army had to return home to defend the people of Carthage. In the end, Scipio defeated Hannibal and Carthage was forced to give Spain to Rome and get rid of its navy. Those concessions made Rome the great power in the western Mediterranean. The defeat of Carthage more than doubled the size of the Roman Republic. Rome's annexation of lands that once belonged to Greece tripled it. In its quest for land and power, the Roman army grew to an enormous size. Even though Rome’s armies were doing well in other parts of the world, the army's needs led to problems at home. Because so many plebeians were needed in the army, many could not work their farms. Many more had watched the army of Carthage destroy their farms and had never quite recovered. At the same time, the expansion of Roman territory brought more and more wealth into the hands of the rich. With their increased wealth, patricians bought up land and used the enslaved people of Carthage to work their land. The result was that the patricians could charge less for their farm products than the plebeian farmers could. That caused many plebeians to go out of business. This problem was partially addressed when a military leader named Marius became consul in 107 BCE. Up until then, serving in the military was part of one’s civic duty - and one was not paid for their service. Marius decided to pay the displaced Plebeians for their military service and promised to reward their service with gifts of land. It wasn’t long before soldiers began to feel more loyalty to their military leaders than they did to the Roman government. That both weakened the Republic and increased the power of military leaders. As the power of military leaders increased, and as military leaders competed against one another for power, a series of civil wars raged across the Republic. From those civil wars, three men emerged as the most powerful in Rome. In 60 BCE, three generals - Crassus, Pompey, and Julius Caesar - formed the first triumverate and shared the responsibilities of ruling Rome. Not long after they came to power, Crassus was killed in battle. Soon after the death of Crassus, Julius Caesar and Pompey, even though they were friends, found themselves rivals in a quest for power. Julius Caesar was a powerful and skilled general in the Roman Army. He made many conquests for the Roman Republic. He gained territory in what we know as France, Great Britain, and even parts of Germany. The Romans called these areas Gaul and that is where Caesar was at the time of the death of Crassus. Pompey, on the other hand, was managing Rome’s Spanish territories from Rome. With Crassus dead and Caesar away, Pompey quickly moved to take control. .The first thing Pompey did was have the Roman Senate declare him the sole ruler of the Republic. Next Pompey had the Senate order Caesar to return to Rome, but to leave his army behind in Gaul. Caesar was politically savvy. He knew that if he returned alone Pompey would work to destroy him, so he ignored the Senate’s orders, gathered his troops, and began to march back toward Italy. At the time of Caesar’s return, the northern border that divided Italy from Gaul was the Rubicon River. The Senate’s orders clearly told him not to bring his army across the Rubicon. Caesar faced a tough decision. He knew that if he obeyed the senate and disbanded his army, his career would be over; but if he marched his troops across the river, the Senate would order Pompey and his army to retaliate. Today when people say they are “crossing the Rubicon,” they refer to a very significant decision that cannot be undone - that they have passed the point of no return. Caesar’s army pursued Pompey through Italy, across Greece, and into Egypt. When Caesar and his troops got to Egypt, the ten year old Pharaoh, Ptolemy XIII, presented Caesar with the severed head of his one-time friend, now rival, Pompey. The action both infuriated and saddened Caesar. He ordered a proper burial for Pompey and, upon his return to Rome, commissioned that a statue be made to honor him. Upon taking charge, Caesar knew that reforms were needed, so he filled the Senate with people who supported his goals. With the Senate’s support, he started new colonies so that farmers and soldiers would have land to farm and, instead of using slave labor, he forced patricians to hire workers for their land. He embarked on construction projects to make sea travel easier and to renew urban centers, paving the way for the building of new temples and theaters. He gave cities more control over their own affairs, and he created a police force. And, to show a genuine concern for his people's welfare he oversaw grain operations so that all Romans, from poor to the wealthy, could get enough to eat. Caesar’s supporters thought that he was a strong leader. His enemies, however, thought that he wanted to be king. Many patricians and military leaders feared Caesar. They thought he was too powerful and thought his power would destroy the Roman Republic. Some Roman senators started to conspire against Caesar. 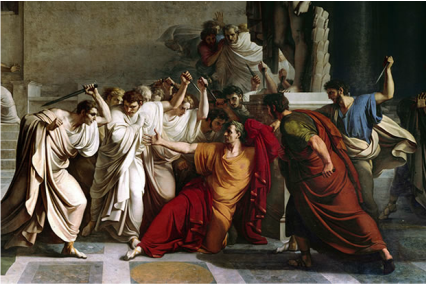 On March 15, 44 BCE, Caesar was on his way to meet with the Senate when he was confronted by a mob of angry Senators. He was stabbed repeatedly. He collapsed and died at the base of the statue of Pompey that he had commissioned upon his return to Rome. Caesar’s death brought an end to the Roman Republic, which had lasted nearly 500 years.